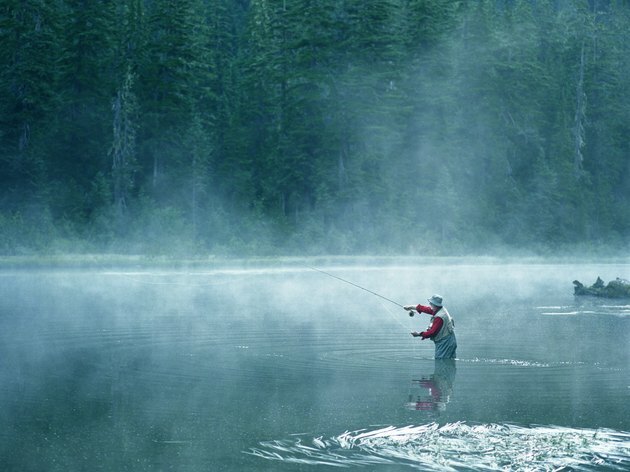 Western Washington is home to some of the best fishing lakes in the Pacific Northwest. Deep reservoirs and clear mountain lakes provide anglers with numerous opportunities to hook up with bass, trout and a variety of other game fish. Whether you prefer to fish from boat or from shore, there are plenty of places to do it in Western Washington. Many lakes in southwest Washington are known for being excellent multispecies fisheries, where cold-water game fish like rainbow trout and landlocked salmon swim alongside warm-water species like bluegill and largemouth bass. Lewis County's Riffe Lake is one of the largest and best options, spanning more than 11,000 acres. You can catch smallmouth bass in rocky near-shore areas, crappie around submerged vegetation and several species of trout and salmon in deep water near the dam. Neighboring Swofford Pond is a more secluded lake with outstanding fishing for largemouth bass, channel catfish and panfish, along with a few giant brown trout. Lake Kapowsin, Rapjohn Lake, Mineral Lake, Silver Lake and Lake Whitman are also productive fishing spots in the southwest corner of the state. The high-elevation lakes of northwest Washington are known for stunning mountain scenery and excellent trout fishing. Brook, brown, rainbow and cutthroat trout are abundant in many mountain lakes, and the Washington Department of Fish and Wildlife stocks these fish by the millions every year. Several lakes within Cascades National Park -- including neighboring Gorge Lake and Diablo Lake -- support self-sustaining populations of wild rainbow trout. Ross Lake, which straddles the border between Washington and British Columbia, is a massive 11,400-acre reservoir that harbors several trout and salmon species. Another option is 35,600-acre Lake Chelan, Washington'a largest inland lake, which offers a similarly diverse cold-water fishery that includes lake trout, rainbow trout and chinook salmon. The city of Seattle overlooks Puget Sound in west-central Washington, and several of the state's best lakes are a stone's throw from the city. Fishing options in the Seattle area include the aptly-named Fish Lake, which is open to shore fishing and small car-top boats and often rewards anglers with yellow perch, largemouth bass and trout. Lake Margaret also offers bass and trout fishing in the area. Lake Washington is the largest lake in the Seattle Area at nearly 22,000 acres and supports just about every game fish in the region. Nearby Lake Sammamish is also excellent, with cutthroat trout, smallmouth bass and yellow perch. Wherever you decide to go fishing in western Washington, you need to have a fishing license. You can purchase a current Washington fishing license at most bait shops and sporting goods stores across the state. The Washington Department of Fish and Wildlife also provides an online licensing service. A free guide to the state's fishing limits, seasons and other regulations is available through the Fish and Wildlife website and anywhere licenses are sold. Many lakes have location-specific regulations, especially for trout fishing, so be sure to check ahead if you plan on keeping your catch.